Tyke tickets are available for guest 5 and under accompanied by a parent with a valid lift ticket. All prices in CAD (including HST). Lift tickets are valid for the 2018/19 Season, weather and conditions permitting. All rates and dates subject to change. 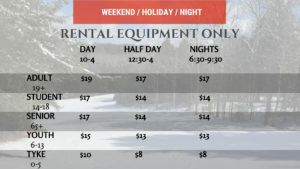 Weekend and Holiday pricing in effect Saturdays and Sundays during the 2018/19 Season as well as December 24, 2018 through to and including January 4th as well as February 18, 2019 through to and including February 22, 2019. Lift tickets are non-refundable, resale is prohibited. Adult aged 21-64, Senior aged 65+, and Youth aged 5-17 at time of purchase. Night skiing is scheduled tbd.